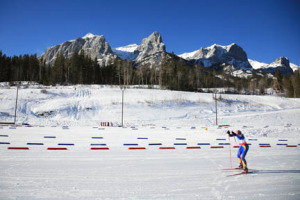 The sprawling Canmore Nordic Centre on the outskirts of town was built for the 1988 Winter Olympic Games. The cross-country skiing and biathlon (combined cross-country skiing and rifle shooting) events were held here, and today the center remains a world-class training ground for Canadian athletes in a variety of disciplines. Even in summer, long after the snow has melted, the place is worth a visit. An interpretive trail leads down to and along the west bank of the Bow River to the barely visible remains of Georgetown, a once-bustling coal-mining town. Many other trails lead around the grounds, and it’s possible to hike or bike along the Bow River all the way to Banff. Mountain biking is extremely popular on 70 kilometers (43.5 miles) of trails. Bike rentals are available at Trail Sports (below the day lodge, 403/678-6764, 9 a.m. to 6 p.m. daily); $22 per hour and $55 per day for a front-suspension bike, $28 and $80, respectively, for a full suspension bike. In summer, you can also play disc golf (Frisbees are available at Trail Sports). Snowmaking guarantees a ski season running December to late March, with rentals and instruction available through Trail Sports. The day lodge (403/678-2400, 8 a.m. to 4:30 p.m. daily) has lockers, a lounge area, a cafe (10 a.m. to 4 p.m. daily), and an information desk.